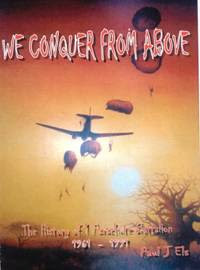 The book WE CONQUER FROM ABOVE on the history of 1 Parachute Battalion 1961-1991, will soon be available by Paul J Els. It is a soft cover book, A4 size, with 336 pages and contains c. 1000 black/white photos of which most have not been published before. The cost of the book will be R360 (add R20 postage – local) after the closing of pre-orders. Pre-order with a discount of R60 can be done now till the end of February 2010. Dealers to contact author directly for orders.